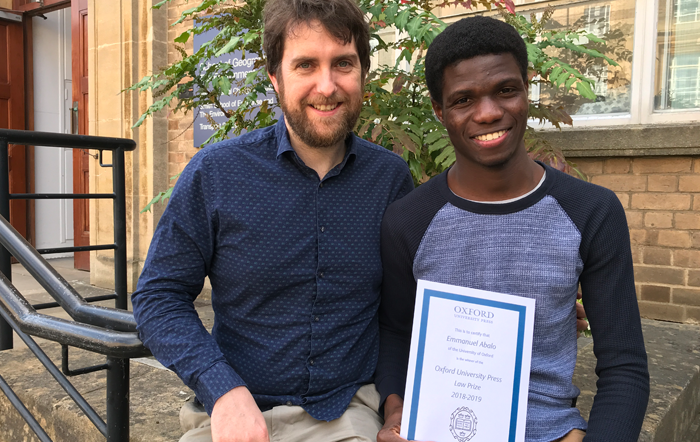 MSc student Emmanuel Abalo has been awarded the Oxford University Press (OUP) Prize for International Environmental Law. This prize, generously sponsored by OUP, is awarded to the Environmental Change and Management MSc student who receives the top mark in the International Environmental Law elective. The elective is taught by Dr Catherine MacKenzie. Emmanuel researched international dispute resolution in the International Tribunal for the Law of the Sea, focussing on the 2017 case, Dispute Concerning Delimitation of the Maritime Boundary between the Republic of Ghana and the Republic of Côte d'Ivoire. Emmanuel's prizewinning essay was entitled 'The Effectiveness and Impact of International Law on the Management of Maritime Boundaries. The Management of the Gulf of Guinea and Atlantic Ocean in Africa: Ghana and its neighbouring states'. The attention of Africa littoral States’ have been drawn to the ‘sea blindness’ after decades of neglect of the maritime domain due to recent persistent pressures arising from the discovery of hydrocarbons. This essay examines the effectiveness of international tribunals in the resolution of maritime boundary dispute in line with the United Nations Convention on the Law of the Sea (UNCLOS) procedure using the seven-year Ghana-Côte d’Ivoire maritime dispute in the use of the Atlantic Ocean as a case study. I argued that, although UNCLOS is not perfect in adjudicating maritime disputes due to the lack of monitoring and enforcement mechanism, it is a good model for charting peaceful dispute resolution among sub-Saharan Africa littoral States in a concerted and timely manner. I recommended that, future amendments of UNCLOS pursuant to articles 312-314 should consider incorporating an effective monitoring and enforcement mechanism after adjudication proceedings to help strengthen its objective as the legal order for the seas and oceans.